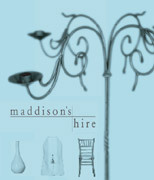 Maddison's hire products include a wide range of chair covers, table linens, candelabra, floating candle bowls, vases, table lamps and gazebos. Our products are regularly featured in leading New Zealand magazines, including: New Zealand House and Garden; New Zealand Bride and Groom; and New Zealand Weddings. We also exhibit at the Bride and Groom Show held in Auckland each May and The Food Show held in Auckland in June.